These brief Test Descriptions that are provided on this web site have been prepared for use as a ready reference and do not have legal force or effect. A force equal to 20 times the system mass will be applied through the CG in a rearward longitudinal direction. 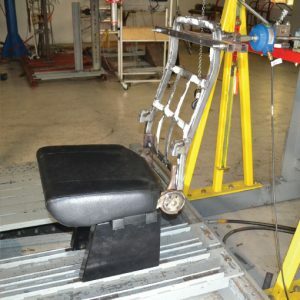 Once engaged, the restraining device for a forward facing seat shall not release or fail. Equivalent CMVSS test also performed. 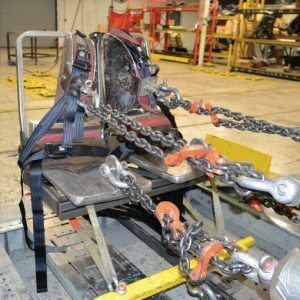 [Type I Seat Belts] A force of 5,000 lb shall be applied to each seating position’s lap belts at 10° ± 5° above the horizontal plane. In addition, a force equal to 20 times the system mass will be applied simultaneously through the CG of the seating system. The required forces must be reached within 30 seconds from the onset of the test then, when reached must be held for 10 seconds. [Type II Seat Belts] A force of 3000 lb shall be applied to each lap and shoulder belt at 10° ± 5° above the horizontal plane. In addition, a force equal to 20 times the system mass will be applied simultaneously through the CG of the seating system. The required forces must be reached within 30 seconds from the onset of the test then, when reached must be held for 10 seconds. 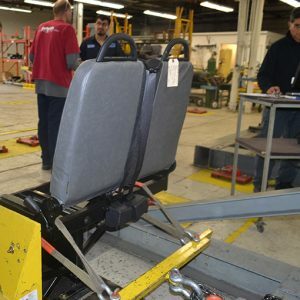 [Type I Seat Belts] A force of 5,000 lb shall be applied to each seating position’s lap belts at 10° ± 5° above the horizontal plane. The required forces must be reached within 30 seconds from the onset of the test then, when reached must be held for 10 seconds. when reached must be held for 10 seconds. [Child Restraint Seats] Attach the SFAD 2 to the two lower anchorages of the child restraint system. Apply a pre load force of 112 lbs 10° ± 5° above the horizontal plane to a Point X of the test device. The force is increased to 2,472 pounds in not less than 24 seconds and no more than 30 seconds and maintain the force for 1 second. The lower anchorages shall not allow Point X on SFAD to be displaced horizontally more than 6.88 in. 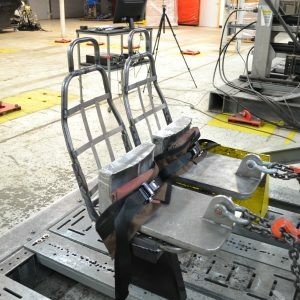 [Child Restraint Seats] Attach the SFAD 2 to the two lower anchorages of the child restraint system and attach the SFAD 2 to the tether anchorage. 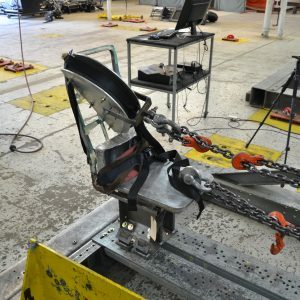 Apply a preload force of 500 N (112 lbs) at Point X of the test device. Increase the pull force as linearly as possible to a full force application of 15 000 N (3372 lbs) in not less than 24 seconds nor more than 30 seconds and maintain the force for 1 second. 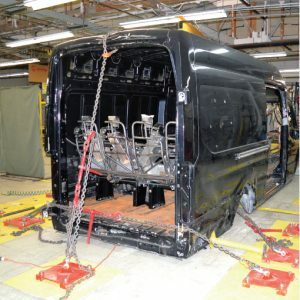 The tether anchorage must not separate completely from the vehicle seat or seat anchorage or the structure of the vehicle. Force is applied to the shoulder block loads. Apply a force of 1,114W N (700 pounds) horizontally in a forward direction through the lower loading bar at the pivot attachment point. The seat must not deflect more than 356mm [14″] before absorbing 452 J [4000 in-lb] of energy per seating position. The force-deflection curve must fall within the zone specified by the standard. No mechanical or material failures are allowed during the test. The loading bars must be at the following heights: Upper Bar 16″ above the Seating Reference Point (SRP), Lower Bar within 4″ of SRP. 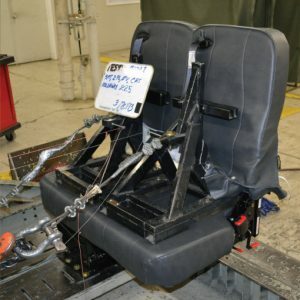 The seat must not deflect more than 254mm [10in] before absorbing 316J [2800in-lb] per seating position . The force-deflection curve must fall within the zone specified by the standard, the seat back shall not exceed 9,786N [2,200lb]. No mechanical or material failures are allowed during the test. The loading bar must be at 13.5″ above the Seating Reference Point (SRP). 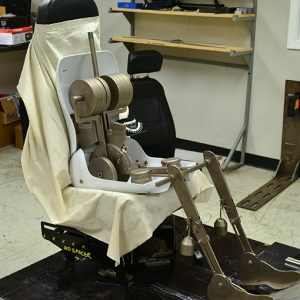 Seat back handhold and armrests shall withstand 25,000 impacts in each direction of a horizontal force of 125 pounds with less than 1/4-inch permanent deformation and without visible deterioration. 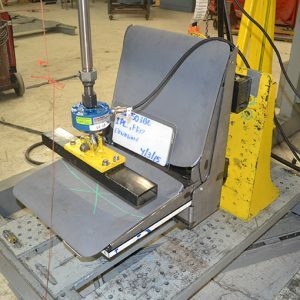 The seat assembly shall withstand static vertical forces of 500 pounds applied to the top of the seat cushion in each seating position with less than 1/4-inch permanent deformation in the seat or its mountings. The seat cushion shall withstand repeated impacts of a 40-pound sand bag. The sand bag shall strike the seat cushion 1,000 times each from distances of 6, 8, 10, and 12 in. 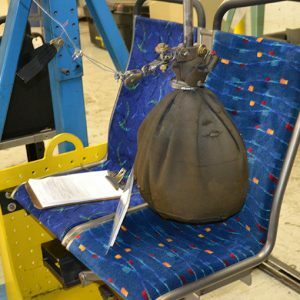 The seat back shall withstand repeated impacts of 40-pound sandbag without visible deterioration. The sandbag shall strike the rear of the seat 40,000 times. Each sandbag shall be suspended on a 36-inch pendulum and shall strike the seat back 10,000 times each from distances of 6, 8, 10, and 12 inches. This test is not covered by our current A2LA accreditation. The upper rear portion of the seat back and the seat back handhold immediately forward of transverse seats shall be padded and/or constructed of energy absorbing materials. During a 10g deceleration of the bus, the HIC number (as defined by SAE Standard J211a) shall not exceed 400 for passengers ranging in size from a 5th percentile female through a 95th percentile male. This test is not covered by our current A2LA accreditation. All transverse objects, including seat backs, modesty panels, and longitudinal seats, in front of forward facing seats shall not impart a compressive load in excess of 1,000 pounds onto the femur of passengers ranging in size from a 5th-percentile female to a 95th-percentile male during a 10g deceleration of the bus. This deceleration shall peak at .05 ? .015 seconds from initiation. This test is not covered by our current A2LA accreditation. 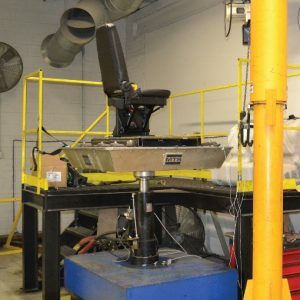 FSTL is able to perform a wide range of tests on the MTS Single Axis Vibration Table. We are able to control on acceleration, frequency, and displacement. This table also allows us to input time based road data to simulate real time acceleration vs. time. 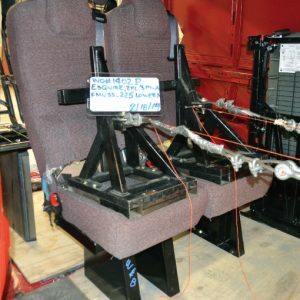 Deformation of the seat resulting from two 95th-percentile males striking the seat back during this 10g deceleration shall not exceed 2 inches, measured at the aisle side of the seat frame at height H. Seat back should not deflect more than 14 inches, measured at the top of the seat back, in a controlled manner to minimize passenger injury. Structural failure of any part of the seat or sidewall shall not introduce a laceration hazard. This test is not covered by our current A2LA accreditation. 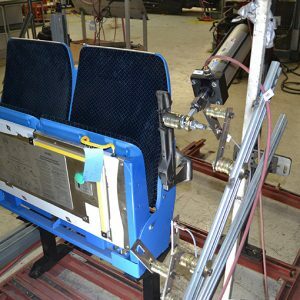 The seat assembly shall withstand static horizontal forces of 500 pounds evenly distributed along the top of the seat back with less than 1/4-inch permanent deformation in the seat or its mountings. Seat back handhold and armrests shall withstand static horizontal and vertical forces of 250 pounds applied anywhere along their length with less than 1/4-inch permanent deformation. The H-point is used as a key reference point in seated occupant location, seating package configurations, EPA volumes and crash test positioning. The OSCAR H-point machine provides the physical representation of this reference point and is a vital element for design, auditing and benchmarking of seating and interior packages. 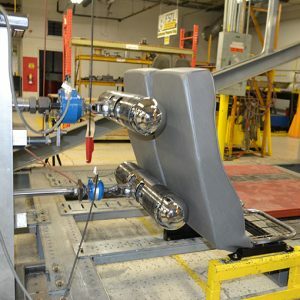 The OSCAR machine is used in conjunction with J 826 and is currently referenced in FMVSS regulations and ISO standards, making it the required design and auditing tool for current production. Controller has 12 inputs and 8 outputs with dual 3 port, 3 way pneumatic solenoid air valves. FSTL is able to custom program component or full system tests with software. This is accomplished with magnetic proximity sensors and various pneumatic cylinders.